This story is for the female shooters out there. Ever think about becoming an NRA Certified Instructor? You can make that happen at this year’s NRA Convention in Indianapolis. Starting on Friday, April 25th, the first day of the Annual Meetings & Exhibits, a few dozen ladies will gather at the Indiana Convention Center for a 3-day NRA Pistol Instructor course. All the instructors are women. The entire course runs $250. That covers the course materials, range use, firearm use, ammunition and range equipment. After all is said and done, you will be required to demonstrate solid and safe pistol handling skills and successfully complete qualification exercises as well as receive the endorsement of the NRA Training Counselor conducting the course. Accomplish that and you will become an NRA-certified pistol instructor. To learn more the NRA female instructor development program, contact Diane Danielson at femaleinstructors@nrahq.org or 703-267-3999 for an application. CLICK HERE for more details. In this video, Tatiana Whitlock talks about becoming an NRA Certified Instructor (1:40 time mark). Tatiana is also a martial arts expert, who favors the Israeli Krav Maga self-defense system. 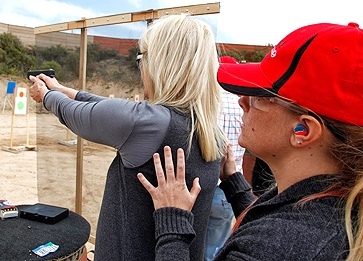 Share the post "Pistol Instructor Training for Women at 2014 NRA Convention"